Warren has invested the time, effort and money to research new manufacturing methods and parts to modernize hydraulic lifting fifth wheels. We have used finite element analysis (FEA) along with real world practical experience to upgrade our designs. This has allowed us to build the wheels you need for your application. We also maintain a large inventory of both finished wheels and parts to serve your needs. 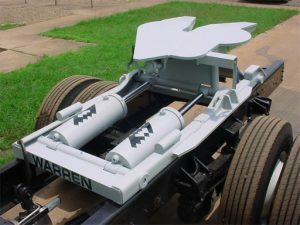 Warren’s model FW-45 is our best selling 5th wheel used to convert any road tractor to be used as a spotter truck. The Warren 5th Wheel can save your company thousands of dollars compared to buying a dedicated yard spotting truck. Visit our sister website: http://hydraulicfifthwheels.com/ to learn more about this great product!